We love to share our knowledge with other people – especially with growing tech companies and IoT passionates. That’s why we couldn’t say “no” when Startup Poland invited us to Rzeszów to the first Startup Poland Camp. Startup Poland is the foundation settled up by the polish startups – to connect, support and represent them in front of the government. 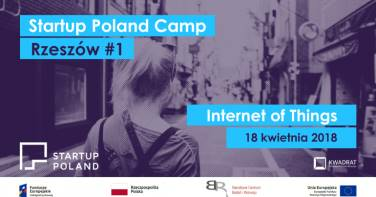 Together with the cooperation of Polish National Research and Development Center, they are setting up Startup Poland Camp in Rzeszów. Why Rzeszów? The city is one of the fastest growing tech hubs in Poland – full of well-educated tech people with amazing ideas. It’s also a home for few interesting startups. Even Samsung decided to open there their IoT Startup Inkubator to support local IoT lovers. The topic of the meeting is the Internet of Things. That’s why Startup Poland decided to invite the experts and startups from the IoT industry – to share knowledge and experience during presentations and Q&A session. It’s a great chance to meet the CEO of Thaumatec – Krzysztof Berezowski. Krzysztof is an ex – long-term research scientist at multiple universities around the world – Wrocław University of Science and Technology, University of Arizona, Arizona State University, Institut National Polytechnique de Grenoble. He will talk about cooperation between IoT tech-partners and startups. After everything – amazing networking with the thing that everyone loves – pizza! If you are in Rzeszów on 18.04 and want to listen to our CEO, please register HERE! 0 comments on This time we are going to Rzeszów, to support startups!